What is the neatess project? Do you do custom furniture? Q: How long have you been doing this type of work? A: Really, all my life. I started when I was 8 or 9 years old and I'm in my mid fifties...., professionally, I started in 2002. Q: Do you repair furniture? A: Yes, I do now. When I started out in 2002 there were several good furniture repair shops in town and I never really pursued that work. Over the last few years I've gotten more and more calls and I've started taking some repair jobs. Q: What is your lead time? How busy are you? A: Usually 3-6 months for big projects. Smaller projects I can squeeze in within a couple weeks- usually. Yes, I've been blessed with steady work. Q: What is the neatest project you've worked on? A: Big project: Bookcase that was really a hidden door. Small Project: A hand carve rose mounted in a walnut turned vase, a gift for the wife on Valentines Day. Q: Is there something you seem to specialize in? A: Yes! 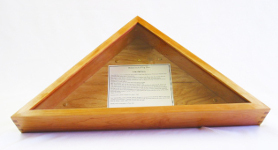 I make flag cases for U.S. burial (memorial) flags. I've been making these for over ten years and have what I believe to be the finest case for the money anywhere. As a veteran myself, I take special pride in making these and talking with the families about their loved one. I also make a soap rest from white oak that I sell nationwide. Check out my Etsy store at www.etsy.com/shop/hoosierwoodworks . 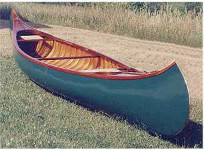 Q: I have an old canoe that was my (insert father's, grandfather's, uncle's, name here). Is it worth restoring? Q: Do you make custom furniture? A: Yes. 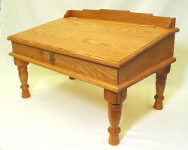 Tables, bookcases, cabinets- I consider custom furniture the heart of woodworking and craftsmanship. (Though I've only made one chair, a Mission-style arm chair. It turned out very nice). Q: Do you do upholstry? A: Yes, when I have to as part of a repair. I'm probably not the best person if you want your sofa reupholstered. A: Yes, happy to help. Just contact me and we can set up an appointment.